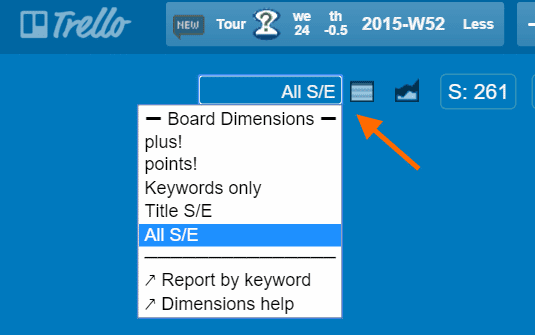 Use Board dimensions on any Trello board to view Spent /Estimate /Points using a variety of filters. If you are not yet familiar with how Plus tracks Spent and Estimate, read here first. Lets you store Estimates or Spent in the title of the card (and card checklist items). See this help card for more. Plus supports two syntax. The "Title S/E" option will only show S/E from card titles. Make sure to check the appropriate preferences for parsing card titles in Plus help, Preferences. If both are unchecked, "Title S/E" will not show. If you use a "points" system (like scrum), you usually set Estimates (or points or effort) per card, not per card per user because assigning tasks to specific users happens later in the project cycle. It is possible to use a Plus "global" user to assign those initial estimates, or you may store those in card titles. Some prefer the later because they come from systems (like Scrum for Trello) that uses a card title format to set the (estimate in parenthesis) with an optional [spent in brackets]. By default, Plus uses a single keyword for your card S/E entries. If you use multiple keywords, all your keywords (listed in Plus help, sync by card comments section) will also show in the Dimensions drop-down. Multiple keywords are useful to categorize S/E in multiple ways (areas, skills etc). Only the "Sync" option by "Trello card comments" supports multiple keywords. ★ "All S/E" shows all combined S/E (card title and Plus s/e). Plus shows "card title s/e" with a darker shade to help differentiate from Plus s/e. ★ Plus S/E has precedence over card title S/E. If a card has both Plus S/E and title S/E, only the Plus S/E is shown unless you set the dimension to "Title S/E". ★ Don't see the dimensions drop-down? Make sure you check one of the card title preferences. If you uncheck both preferences and do not use multiple keywords or do not sync by "card comments" , the dimensions drop-down will not appear. ★ Sign-in to Chrome to sync your selected dimension (along many other settings like your active timers) to your other computers.